In Industrial applications, various parameters like temperature, pressure, flow, humidity or electrical parameters like voltage, current, frequency etc are to be displayed to be viewed from greater distances. 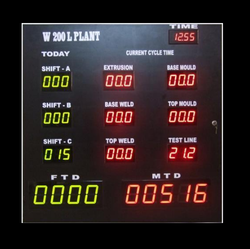 LED Display Systems can accept multiple inputs so as to work as Jumbo Display Scanners. Looking for Light Display Systems & Signages ?